Once the sandstorm has passed, Shredder arrives on the scene and lifts the unconscious body of Splinter, cursing his existence. Ninjara, Al ‘Falqa and the TMNT arrive and a battle breaks out, but our heroes are soon trapped inside a force field created by a new villain, the cat mutant cyborg from the future named Verminator-X! Verminator-X kicks the force field bubble and sends our team rolling through the sand. 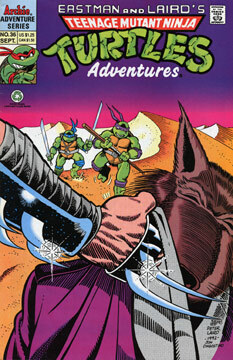 The villains then climb onboard their camels and take Master Splinter with them as they ride off into the desert. Several hours later, the force field finally collpases and frees our heroes. Al ‘Falqa sends his falcon ally, Talyn, to find their foes. The bird soon finds Shredder and his new henchman. Verminator-X spots Talyn and fires, but his shot only wounds the bird rather than killing it (much to Master Splinter’s pleasure). Talyn tells Al ‘Falqa that Shredder is camped at a nearby oasis, and the eagle mutant leads the Turtles through a foggara (an underground aqueduct) to the spot. Verminator-X and Shredder are waiting for a time-slip portal to open, which will give them the means to escape with their prize – the stolen Black Stone of Mecca. Except they didn’t escape with the Stone! Ninjara had used her thieving skills to replace the Black Stone with a fake while Al ‘Falqa kept the criminals busy. The mighty eagle mutant is overcome with gratitude and kneels in praise with the real Black Stone of Mecca.